Posted on Friday, October 5th, 2012 at 7:09 am by Ty Anderson. Access changed my life. Ever since I picked up a copy of the Access 97 Developer’s Reference, I have been enamored by Microsoft Office Access and how it can be utilized to build solutions. The first application I ever wrote was in Access 97… for a shipping company. It scanned shipping manifests. They loved it. I loved it. Eventually, the client outgrew the solution as well as Access. I did as well. I embraced SQL Server and .NET. I still loved Access but it was relegated to a utility tool. But I’m here to tell you that Office 2013 Access is back in a big, big way. To understand the new release, it is important to understand where Microsoft invested their resources (i.e. money and effort). For this release, Microsoft invested heavily in turning Access 2013 into a tool for creating web apps that run within SharePoint 2013. In MSFT parlance, this is a “big bet”. 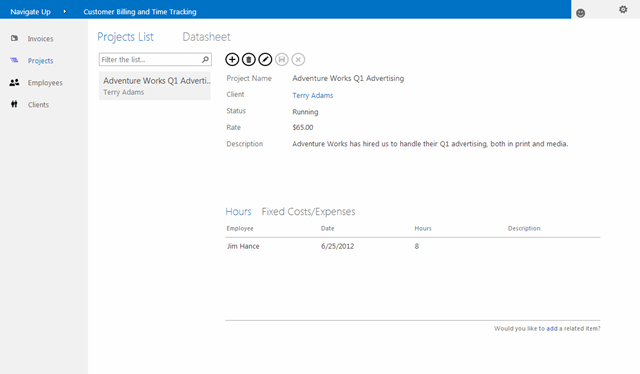 Thus, if you plan to use Office Access 2013 to build solutions, the preferred solution model is this new web-based model. Sure, you can still create .ACCDBs but these formats are officially a thing of the past. To create this now forsaken solution type (as well as .MDBs) you might be better off sticking with previous versions of Access. I’ll leave that decision up to you however. Sure, Microsoft has tried this before with little success. They failed because the features appeared to be an afterthought. Almost like, “hey this Interweb is turning out to be big deal, can we get “Jimmy The Intern to throw together some Internet publishing features? Maybe a grid that connects to a table and some animated GIFs?”. These features were not something a professional (developer or business user) would want to claim as their own. As a result, Access suffered. But with this release, every indication is the features are up to snuff. Just look at the screenshots in the blog post! 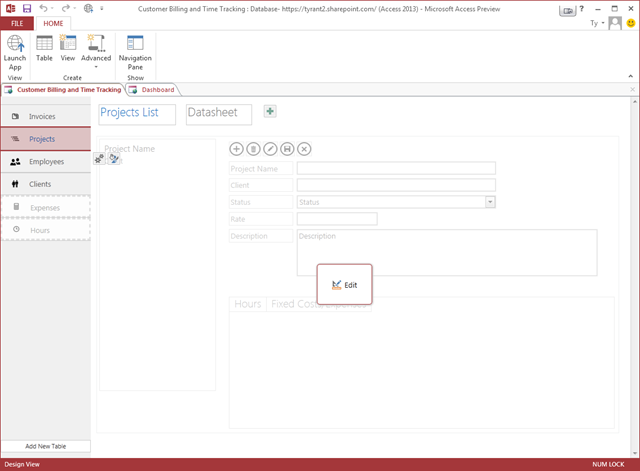 You can quickly build an application and publish to SharePoint 2013. Microsoft likes to call this “going 0-60″. This is true if you use one of the templates like the Time and Billing template I used to create the screenshots above. It is less true if you start from scratch. The end result is a professional look with high degree of functionality… without the need for code. 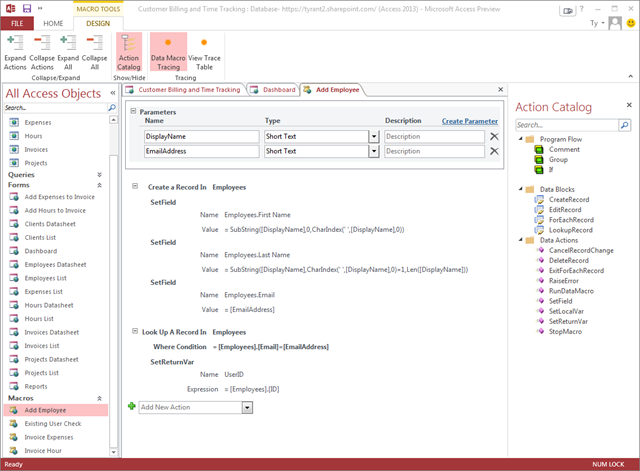 If you need to implement some moderately complex business rules, you can utilize the new custom macro language. It isn’t VBA but they do let you automate the UI and manipulate data. What’s so radical about Office Access 2013? Good question. Let me respond with a list. Access 2013’s preferred model is the cloud. Desktop solutions are secondary. Access 2013 lets non-developers build WEB applications. It’s like Access 2.0 … but for the web. You can publish Access 2013 to either a private corporate app catalog or to the Office App Store. If you decide to charge for your app, you just might rake in a few million bucks. Access 2013-based apps now support devices all of shapes, sizes, and OSs. This last point is my favorite. I am a developer and I like to write code. However, I love the fact I can build an app in Access, publish it to the Office 2013 App Store, have customers buy it and then use it on their desktop and their iPad. Will these changes be enough to make Access relevant again? I think so. Perhaps a better question is, how will IT Admins respond to the potential proliferation of Access 2013 apps? Nice post. What I’m trying to figure out is how to deploy Access 2013 apps to my clients. I really need web connectivity and cross platform solutions but am unsure how the nuts and bolts work. My clients are small businesses- 1 to 15 users per data file BE. Currently I sell licenses to an accde FE and accdb BE and install on desktops and LAN with an exe file. If I use Access 2013 and want to make it he app available off an LAN then do each of my clients need their own Sharepoint account? If so that just won’t work for my clients- they need simplicity. Perhaps you could clarify a single apps deployment to many different clients, each with their own data- thanks! I have to strongly disagree that 2013 is an exciting release. Microsoft fumbled the ball with this release with the features they decided to REMOVE. It’s early still, and maybe someone will step up to fill the gap. But as it stands now, Access is a dead-man walking in our environment. You raise some good points. It’s disappointing to see useful features retired. Of those you listed, I really wish MSFT would enhance Pivot Tables. I’m addicted to Pivot Tables. Source countrol is important to me too. I believe Access 2013 is leaving old ways behind in order to more quickly head in its new direction…which I take to be as a development tool for Apps for SharePoint. I’m going to investigate further and report back what I learn. Ty if you have any inside information on what Microsoft recommends for source control for Access based solutions, man I’d love to know!! I was playing around with the idea of rolling our own solutions with exporting the database objects as text files, but I see they removed the SaveAsText() and LoadFromText() methods. You are right on about moving apps to Sharepoint tho, that is clearly their focus for the last couple of releases. I don’t have inside information at the moment. BUT…I have contacted a few friends at MSFT to learn what I can learn. I’ll report back here what I discover. And yes, it seems Access is more of SharePoint tool now instead of an Office desktop tool. A little. Access is definitely a SharePoint tool now. Yes, you can still build desktop database apps with it but MSFT is investing Access’s development dollars in SharePoint. It appears that LightSwitch is the new Access. It might eventually support the Office App Store model too. My sources say LightSwitch is popular within many enterprise-class businesses. I’ve started to take a better look at LightSwitch but this is just more confusion from MSFT. Thank you so much Ty, I will look into LightSwitch! Access programmer here and seen lightswtich html version. You can make fully html applications using IIS and SQL Server, and not need sharepoint like you do for Access 2013. Any opinions here on which I should learn, I think the client server model is dead ? I think LightSwitch. The more I read about it, the more I like what it offers. Plus, I think MSFT will provide support to their App Stores (Office, SharePoint, and Windows). LightSwitch looks like a RAD tool for these types of apps. My beloved Access is suffering from a lack of message and roadmap. I can’t work out if you were paid by Microsoft to write this or you honestly this this is the way forward?! Microsoft have played about with Access so much, there’s almost no point in using it anymore. To TRY to move across to ‘web apps’ is too little, far too late. If you want to do this there’s ASPMaker, Ironspeed and many other better solutions. Access+Sharepoint doesn’t cut it at any level. The company should have created a new product for web development and left Access well alone. How do you do the code behind; all the event programming; write to local files; import and export data; upload images (easily); automate other office products like Outlook, Word and Excel. The answer is, YOU CAN’T. Microsoft’s efforts at creating web TOYS has probably destroyed Access as a product and although, never a ‘professional’ (whatever that means) front end/back end system, it was like a Swiss Army Knife where you could always find some part of it that would do the job and every boy scout knew how to use some or all of the tools. I too have been programming Access since 97, with the ‘best’ version being 2003, probably. Very little VBA development has happened since then but Microsoft has taken my and my client’s money for each upgrade while providing little that is new and taking away many useful features. In the same way Hewlett Packard have screwed up their business by providing printers which can no longer feed paper without jamming or know what type of servers to build, Microsoft seems completely lost it what it thinks it needs to provide. It spends too much time listening to it’s own PR department and too little listening to those who use the products. It’s incredibly sad that Microsoft has done this and stopped developing Office for the developer. Many of us are now using alternatives and are unlikely to revisit this failing software. I received absolutely no love from MSFT for this post. This is simply my thoughts about what Access 2013 is. I agree that it is a far different tool that the days of Access 97 and Access 2003. However, you can still create local databases with VBA using Access 2003. That part is largely unchanged. Certainly, it has not been improved or received any kind of investment. Instead, Access is morphing into a SharePoint tool. Who knows, it might not even exist in the next version of Office. Microsoft is clearly investing in the Apps for Office and Apps for SharePoint model while also supporting existing extensibility models. This why I mention LightSwitch. LightSwitch is to the “web-appified” Office as Access is to the desktop Office. I’m not sure where MSFT is going here but I don’t find much of anything to disagree upon here (except your wondering if MSFT paid to write my opinion :-) ). There Apps for Office model has its place. However, I don’t see its adoption matching COM-based Add-Ins anytime soon. Part of what made Office what it is today is its powerful extensibility. Take away this model (or dumb it down) and you have Google Apps or Apple iWorks. Is that really where MSFT wants to take Office? 2. It was possible to get Access Web Apps working with Sharepoint onprem without having to search through multiple blogs etc. to find instruction how to actually set it up. The documentation provided by MS simply does not work, especially if you’ve installed any Sharepoint cumulative updates. 3. They didn’t drop so many features. For example there is security model, and little integration with Sharepoint security. Your apps have to be read only, or full permissions – that’s it. 4. They didn’t make Access Web Apps on premises the ugly stepchild to Office 365. They’re adding new features to Access Web Apps in the Office 365 environment and not to the on premises environment. Hopefully they will at least address the setup issues with Office 2013 SP1 + Sharepoint 2013 SP1. You make good points. I wish Microsoft would make Access a superior tool for creating applications. Be it database apps, SharePoint apps, Windows Metro apps, etc. I suppose this is now the job of LightSwitch and Project Sienna. More and more, I question what I wrote here and wonder if Access has a future. I am sickened. We just paid an Access guru to design our new desktop database, and got a subscription to Office 365 with Sharepoint. The subscription gives us all the latest Office 2013 programs. Now we can’t publish the database unless we go back to Access 2010! I am embarrassed to have argued in favor of MSFT and Access, and I can’t help feeling used, manipulated, violated, and abandoned. The File may be open. If so, close it…. I have verified the path and security permissions. “Apps” says it all, chasing Apple. SharePoint, lightswitch just how much do you need to pile on a small company with just 1 self taught “IT” person who needs to work most of his time as a cad user. We have had a front end back end database from Access 2000, over the years we have spent an absolute fortune on office, and operating systems. Just to be left out on a limb. Have you tried his suggestions? I am not happy about access 2013 either. As a small business owner, and self taught dev. I am perfectly happy with the client server application I created 10 years ago. Runs great on msde using access to develop it and VB6 for my windows forms. Handles 20 users just fine. I would like to make some upgrades but not interested in a) the cost and b) using the cloud c) we dont need mobile access to our data. I start again to work with accesse from a few weeks and have a problem of layout in a cross-analysis. I can not put all the columns in 1 page in larger. I’ve tried everything but i don’t find the solution. Second question, if i’ve a lot of columns it’s not interesting to have all of them on one page for a question of visibility ans i would like to repeat the first column on all the pages. Can you help me? I’ll do my best to provide some answers. Regarding question #1 – it’s hard to say without seeing the report. Can you send a sample? Question #2 – I think I understand that you want Column 1 on Page 1 to be Column 1 on all pages. In the report designer use the layout view to customize the design. You can repeat column 1 by repeating it between other columns. Just copy & past its related controls and insert it before the column that begins the next page (and re-position the remaining columns to the right). It will take some trial and error to get the page breaks correct but this should work. Guys, just dissapointed, I thought the web future came along with webforms but it did not. So I have to physically copy the front end from onedestop to another….gosh!!! Can someone assist me to know how to convert my access 2010 solution to 2013 with out re-writing it? In theory, you can run your 2010 .accdb file in Access 2013. What issues are your experiencing? I start again to work with accesse from a few weeks and have a problem of layout in a cross-analysis.It will take some trial and error to get the page breaks correct but this should work. Good luck and let me know if you have additional questions.